NEW YORK, NY--(Marketwire - October 10, 2010) - RAIN - A Tribute to The Beatles On Broadway has been extended by popular demand and will now run through Sunday, January 9, 2011 at the Neil Simon Theatre in New York City. Previews for the acclaimed RAIN Beatles concert begin Tuesday, October 19 with the official opening scheduled for Tuesday, October 26 at 6:30 PM. RAIN on Broadway tickets for the additional week go on sale Friday, October 8! As "the next best thing to seeing The Beatles!" (Denver Post), RAIN - A Tribute to the Beatles performs the full range of The Beatles' discography live onstage, including the most complex and challenging songs that The Beatles themselves recorded in the studio but never performed for an audience. From the early days of their appearance on The Ed Sullivan Show in 1964 through Sgt. Pepper and on to the Abbey Road years, RAIN performs it all. A fusion of historical footage and hilarious television commercials lights up video screens and live cameras zoom in for close-ups. While the music of The Beatles has touched millions of people around the world for the past 45 years, the Fab Four were experienced live in concert by very few. Their final concert tour was in 1966 long before the release of many of their classic albums such as "Sgt. Pepper," "The White Album" and "Abbey Road." Today, all the songs from that time are now performed live by RAIN. As the Chicago Tribune cheered, "The enraptured audience relives the soundtrack of its life!" In a show the Los Angeles Times calls "a two-hour homage to pop music's most brilliant gem! ", members of RAIN perform such beloved songs as "I Want To Hold Your Hand," "Hard Day's Night," "Yesterday," "Eleanor Rigby," "Strawberry Fields," "While My Guitar Gently Weeps," "Hey Jude," "When I'm 64," "I Am The Walrus," "Revolution," "Come Together" and much more from their repertoire of over 200 Beatlemaniac favorites. For the creators of RAIN -- the original band -- Joey Curatolo (vocals, bass, guitar, piano), Joe Bithorn (vocals, lead guitar, guitar synthesizer), Ralph Castelli (vocals, drums, percussion) and Steve Landes (vocals, guitar, piano, harmonica) -- all of whom performed in touring productions of the Broadway production of Beatlemania, the music is first and foremost. For more than two decades, RAIN has distinguished itself by focusing on details, always being faithful to The Beatles. 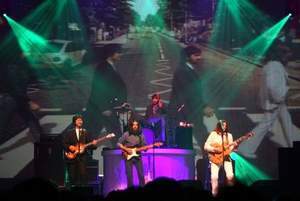 All of The Beatles music is performed live, with no pre-recorded tapes or sequences. RAIN approaches The Beatles music with the same respect a classical musician treats Mozart. RAIN on Broadway is presented on Broadway by Annerin Productions, Magic Arts & Entertainment/Tix Productions and Nederlander Presentations, Inc. RAIN begins previews at the Neil Simon Theatre on Broadway October 19 with the official opening on October 26. The performance schedule will be Monday at 8PM; Tuesday at 7PM; No shows on Wednesdays; Thursday through Saturday at 8PM with a matinee Saturday at 2pm; Sunday at 3PM and 7PM. RAIN on Broadway tickets are on sale now and range from $25 to $120 and are available online at Ticketmaster, by calling 877-250-2929, or by visiting the Neil Simon Theatre box office. For more information visit the official RAIN on Broadway website. RAIN on Broadway - 12 Weeks Only!